A fresh take on the popular Quadrant model, offering greater space and a larger glazed area for a light and airy feel. 1. Colour - Of the frame work - White or Silver finish. 2. Shower Tray - Choose the size of the shower tray to suit the Cubilce you need, a Standard Shower Tray sit flat on the floor and will require the waste pipe placing underneath the floor. A Easy Plumb tray has adjustable legs and a removable front panel and allows for the waste pipework to be fitted above the floor. 3. 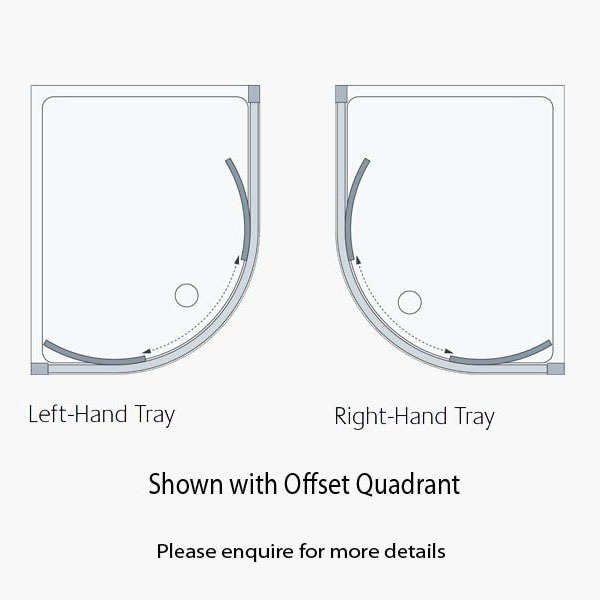 Choose Hand - Choose which Hand you require (a Left Hand Enclosure and Tray is shown in the photo above). If you would like to know the position of the waste in any of the shower trays we supply please click the "Ask a question" button underneath the product picture and will will contact you with the technical specifications. We supply the full range of products by Lakes Bathrooms. If you do not see what you are looking for, please contact us. We also stock a very large range of shower trays, including standard resin shower trays, low profile shower trays, and easy plumb shower trays, in very many sizes. Remember if you order a shower tray at the same time as a shower enclosure, then only the one delivery charge will apply. If you require information on any shower tray please contact us. To see a selection of just some of the trays that we have available, click here to go to our Shower Trays page. Nice product, fitted quite straightforward, and makes good use of the space available. Good value for money.